Unbelievable, announcement today of all days the latest ECB initiative one over a side cricket. Teams will be formed from franchises of different villages around world. The BBC have bought the rights to screen this 5 days a week at 7’o clock and have already called the programme The One Over Show. Yorkshire Grocer Colin Graves says we are trying to look at a new wider audience with a low attention span. 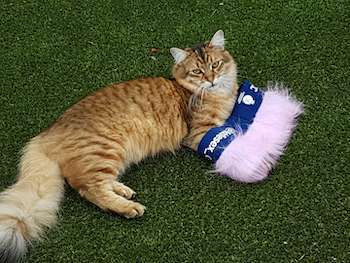 We have done our fool proof research, for example, I have been following that Middlesex Till We Die website and see there is a potential fan base for cats. The rules are simple. One 10 ball over for each side with each ball being delivered by a different player. The game will be finished in 15 minutes so no one will have time to get bored. More rules are under discussion. The batsmen will wear a grossly oversized kit with large boots. The wicket area will be greased up with two fielders sliding the mat from each end of the wicket. Two more fielders will throw water at running batsmen. You have heard of the Big Bash, well this is the Splish Splash. The batters when reach the other end will pour their team’s coloured water from their bucket into a cylinder. The runs will be measured by a dipstick. Colin Graves has volunteered for this role. Ex Middlesex Chairman now involved with ECB when asked about the idea said “I Luv It”. All candidates for the Middlesex Board election apart from Andrew Dow are in favour of this initiative. Vote for Andrew now! The ECB are sending out a survey requesting the true supporters of cricket their views of and have promised to look at all opinions and then put their agenda first. Whether you like it or not this is the way forward for our precious game. Edited 1 time(s). Last edit at 2019:04:02:17:59:00 by BarmierKev. Is there a point in this game you can play the joker called a Graves. Double runs on 1 ball delivered. Will Pinky be the club mascot? I'm sure at the AGM tonight,all these questions will be answered. After a series of indicative votes my cats have voted against this proposal as it does not include treats after every ball. Also fifteen minutes is just too long as it will involve too much hanging around. Manys the truth spoke in jest Kev. You can't rule any of it out. My late cat, Petal, would have yawned through the ten balls waiting for a Graves to be called..
Plus a Graves Strategic Timeout needed for advert breaks and to flog a few extra drinks and pies..
Maybe an indicative vote to be called for and then the Speaker gives it the thumbs down. Rejected three times already. "Gosh, a game that's got nothing to do with cricket, that we can even sell to the pre-Mumsnet generation. Whizzo !!! What a shame Great Uncle Binky couldn't have thought of it before that silly game with batty, stumpy, wickety things that he copied from those peasants taking time off from looking after their sheep in a field. I'm sure we can interest some sponsors - a few estate agent johnnies, some property developers, maybe a cost cutting supermarket or two. Is it a one over super-over? What if the game finishes a draw? Would we produce a tie for winning?